Discover the perfect harmony between turquoise-blue waters and pine green forests and mountains that this beautiful corner of Catalonia holds. The Costa Brava is one of the jewels of the Mediterranean: it combines breathtakingly beautiful coastline with charming medieval villages and spacious natural parks. 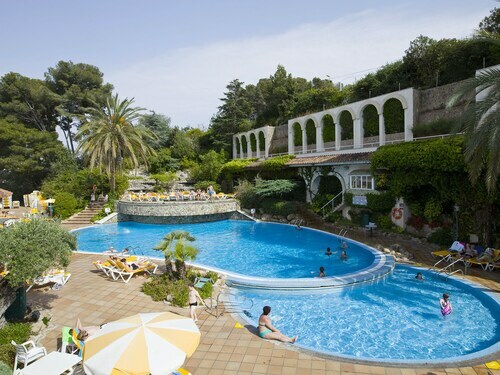 Offering bustling tourist resorts and other spots practically unknown to most summer visitors, there are Costa Brava holiday deals for all tastes: find both unspoilt beaches and large tourist complexes with every service and facility you could need all within a few miles. Multitudes of European tourists fly each summer to this magnificent region, partly because it's easy to find cheap flights to the Costa Brava, but unquestionably drawn by its gorgeous coves and magnificent nature. The region's beaches include the famous Aiguablava beach in Begur, surrounded by an exceptional and almost untouched natural park, and Portitxol beach in L'Escala, where you will also find the archaeological site of the Greek-Roman colony enclave of Empuries, declared a UNESCO World heritage site. Talking about culture, don't miss the region's best-known genius, Salvador Dali. Delve into the surrealist world of the artist at the Dali Theatre-Museum in Figueres, his birthplace. Or visit the postcard-perfect fishing village of Cadaques, which as well as being home to the Salvador Dali House-Museum in Portlligat, offers excellent beaches and stunning views of the nearby Cap de Creus Natural Park. If you're looking for entertainment, join the masses of British tourists who take advantage of Costa Brava holiday deals to enjoy the warm sun, sandy beaches, and lively bars and nightclubs. In nearby Tossa de Mar, you'll find a quieter, atmosphere, great for families with children, as well as a pretty old town with its medieval walled complex. You can get here by car, train or by bus, but you can also opt for convenient flight + hotel to the Costa Brava packages, which will let you land in Girona-Costa Brava airport, or you can fly to Barcelona and hire a car to move around more easily. The Costa Brava offers fun, culture, food and relaxation What are you waiting for? Spain is one of the best locations in the world for a beach holiday. If you like beach holidays in Costa Brava then you're sure to love our cheap beach holidays to Lanzarote or our Marbella beach holidays. Book with Expedia and find out why for yourself. Discover a medieval village with prehistoric remains and a lively resort town on Gerona's famous Costa Brava, in Catalonia. On the shores of the Mediterranean, you’ll find the perfect coastal town for family tourism. Come enjoy your holidays in Santa Susanna. Cadaqués, in the province of Girona, is an old fishing village and holiday destination for the Catalan bourgeoisie since the 20th century. Do you want to know why? Spend your holidays in Llafranc and soak up the Mediterranean spirit in a corner of the Costa Brava where tradition and modernity merge. 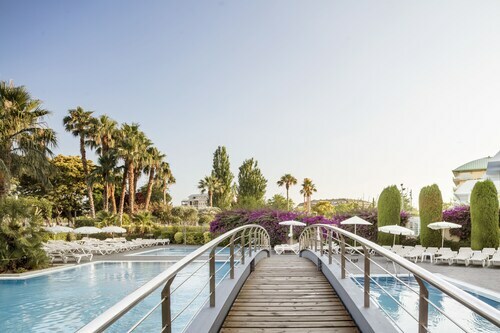 Are you looking for a break next to the sea? Do you want to get to know a medieval village? A holiday in Sant Antoni de Calonge will bring together all the ingredients you need. A holiday in Tamariu truly has everything you’ll need to get away from it all: beach, leisure, tranquillity and delicious cuisine. What more could you want? Swim, sunbathe and enjoy exciting water sports at this beach near Lloret de Mar. Use convenient ferry connections throughout the area to get here. Climb to the top of this historic castle, which is set on a cliff high above the water and offers picturesque views over the beach and city. Go for a walk in one of Catalonia’s finest gardens, an elegant expanse of greenery found in a dramatic setting overlooking the sea. Visit one of Lloret de Mar’s most recognizable landmarks, a surprisingly colorful church with an important place in the city’s history. Relax on the shores of this rugged and lushly vegetated beach and visit one of the captivating attractions found nearby. 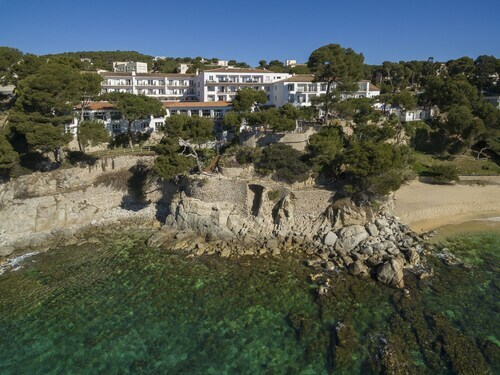 Located in Platja d'Aro, this beachfront hotel is next to a golf course and within 1 mi (2 km) of Cala Bella Dona and Platja d'Aro Beach. Cala Cap Roig and Cala dels Capellans are also within 2 miles (3 km). 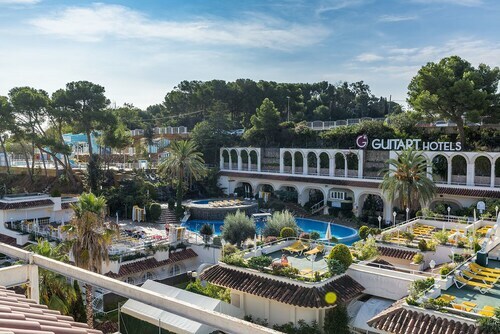 This family-friendly Lloret de Mar aparthotel is located near the beach, within 1 mi (2 km) of Pitch and Putt Papalus Golf Club, Lloret de Mar Beach and Fenals Beach. Water World is 0.9 mi (1.5 km) away. 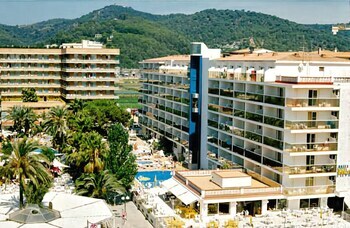 This family-friendly Lloret de Mar hotel is located near the beach, within a 15-minute walk of Lloret de Mar Beach and Fenals Beach. Water World is 0.9 mi (1.5 km) away. 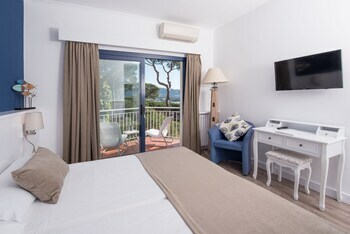 This family-friendly Lloret de Mar hotel is located near the beach, within 1 mi (2 km) of Santa Clotilde Gardens, Lloret de Mar Beach and Fenals Beach. Water World is 1.1 mi (1.8 km) away. 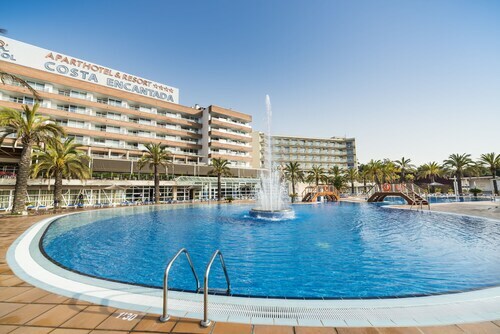 Located in Lloret Town Centre, this family-friendly Lloret de Mar hotel is within a 15-minute walk of Lloret de Mar Beach and Fenals Beach. Water World is 0.9 mi (1.5 km) away. 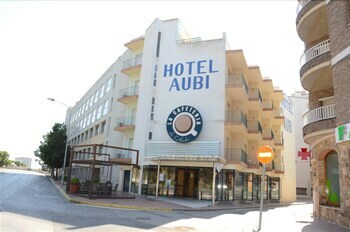 Situated in Cadaques, this hotel is steps away from Esglesia de Santa Maria and Cadaques Beach. Badia de Cadaqués and Salvador Dali House are also within 1 mile (2 km). 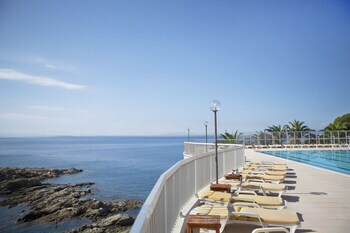 Nestled on the beach, this Palafrugell hotel is within 3 mi (5 km) of Tamariu Beach, Aiguablava Beach and Llafranc Harbour. Sant Sebastia Lighthouse and Can Mario Museum are also within 3 miles (5 km). 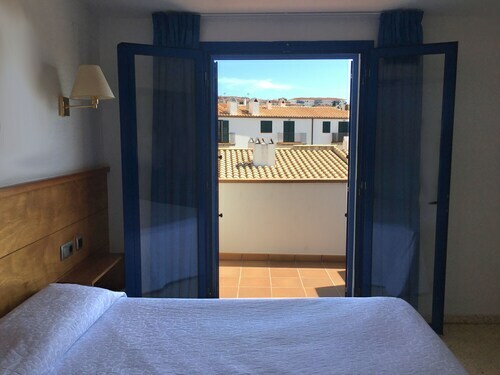 This family-friendly Santa Susanna hotel is within a 15-minute walk of Pineda de Mar Beach and Santa Susanna Beach. Calella Beach is 2.8 mi (4.4 km) away. Santa Susanna Station is only a 2-minute walk and Pineda de Mar Station is 28 minutes.